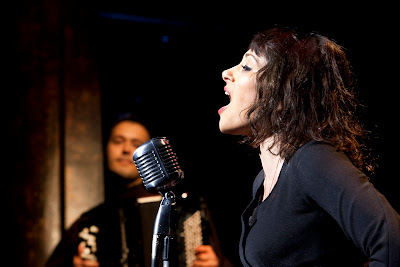 Leicester Curve’s Piaf, Pam Gems' distinctive play about the beautiful but self-destructive arc of Edith Piaf, has new life breathed into the title role by Frances Ruffelle whose immersive performance as the celebrated French chanteuse is quite simply breathtaking. Gems pulls no punches with her writing and this play with songs is not for fans of the singer looking for a sentimental juke-box musical. Her Piaf is at times a tragic junkie, an alcoholic and a foul mouthed whore in a production that is so much more than simply a collection of some of “The Little Sparrow’s” songs. Ruffelle’s portrayal of this brightly burning star that crashed to her death at the age of 47 is as harrowing as it is stunning. The play moves at a pace from Piaf’s troubled early years. The supporting cast context the passage of time skilfully, as key people in the singer’s life are introduced. Whilst many of the cast play several roles, Laura Pitt-Pulford plays Toine, Piaf’s best friend and fellow prostitute from the early years, throughout. Pitt-Pulford has a track record that defines a commitment to excellence and this performance is no exception as she portrays the hard-edged cynicism of a street girl through the years. Tiffany Graves’ Marlene sings Falling in Love Again with a deliciously authentic sound. The six men in the company cover a multitude of parts. The versatile Russell Morton, as her young Greek husband she married shortly before her death, beautifully duets with Ruffelle. Oliver Boot delivers an emphatic masculinity throughout, from hard edged cop to the champion boxer who wins Piaf’s love before being tragically killed in a plane crash and Dale Rapley shifts through several key characters in Piaf’s life effortlessly most notably as the gay promoter who chances upon her street singing and transforms her to professional performer. But it is Ruffelle who defines this show. Shifting from gamine minx, to a morphine abusing broken-bodied frailty, injured from car crashes and addiction, her performance is almost Hamlet-like such is the totality of effort that is demanded from her. Crippled and dying, she switches from shooting–up to commanding the spotlight in the fantasy recalls of Piaf’s numbers, with ease. When she sings in French her voice is a sublime tribute to Piaf, whilst when she sings in English the distinctive timbre and twang that defined her creation of Eponine some 27 years ago, is still there. Ruffelles’s acting is first class throughout with Andrew Whiteoak’s effective wigs provide the finishing touches to her embodiment of the French legend. The staging is simple, with effective use of brickwork, cobbles (a nice Parisian touch from designer Simon Scullion ) and excellent lighting from Arnim Friess. Musically, the three piece band are a delight. Piaf demands an authentic French sound and Zivorad Nikolic’s accordion playing, under the talented Ben Atkinson’s direction and orchestration, creates a Parisian atmosphere that only needs for a whiff of Gauloise to be complete. Paul Kerryson has delivered another well-crafted piece of theatre to this remarkable regional powerhouse. Hopefully the production will tour and maybe arrive in London too. Yet again, the people of Leicester are spoilt with such a gem on their doorstep.